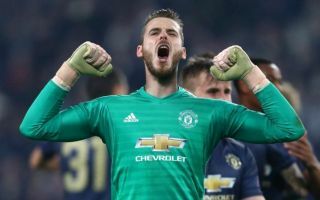 David de Gea produced a decisive display in Man Utd’s win over Tottenham on Sunday, and the club’s faithful loved what he said after the game. The Spaniard was in top form as he produced 11 saves in total to frustrate the hosts at Wembley, particularly in the second half when they began to pile on the pressure. However, they were unable to find a way through and that ensured it is now six consecutive wins for Ole Gunnar Solskjaer across all competitions since he was appointed as interim boss last month. That’s quite the turnaround for the Red Devils given how poorly they were performing under Jose Mourinho during the first half of the campaign, which culminated in his departure after defeat away at bitter rivals Liverpool in December. Although they had to defend and soak up lots of pressure in the second half, there are few who will disagree that Man Utd don’t now look a different team, especially going forward, with Solskjaer bringing his own ideas and approach to the squad. With Paul Pogba pulling the strings and making a decisive impact in the final third to Marcus Rashford rediscovering his goalscoring touch, things are certainly going well for United right now as they continue to close the gap on their rivals above them in the Premier League standings. As for De Gea, he insisted in his post-match interview that “this is the real Manchester United”, and as noted in the tweets below, the United fans were loving it as they also reacted to his pivotal performance in helping his side keep a clean sheet and secure all three points. Give this guy a million a week, I’m serious give this man what he wants, he should earning whatever the club makes!